The organized picks and round 1 standings for this week's tournament are on the website. We chose 28 golfers. As even a retarded chimpanzee (i.e. - a Golf Channel or ESPN analyst) could have predicted, The Cheetah is unanimous. The guy who plays for Tiger's former caddy came in 2nd favorite, chosen 13 times. Matt Kuchar, who I actually saw frown when I was at the tournament Wednesday, made it on to 11 teams. Justin Rose made the cut for 10 players. Nine of us like Brandt. Youngsters Rory and Jason are on 6 teams each. Furyk got the nod 5 times. Schwartzel and Westwood are 4-baggers. No treys this week, but Rickie, Zach, Webb and Keegan are all deuces. The unique picks added up to 14. Chris and Dave A. have 3 each. Randy and Mike M. have 2 each. Brett, Dave B., Mike D. and I have one each. 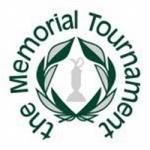 The remaining 7 players didn't find Memorial uniqueness this week.